Anti-vaxxers and MMR: What’s the monetary cost of not vaccinating a child? What’s the Monetary Cost of Not Vaccinating a Child? 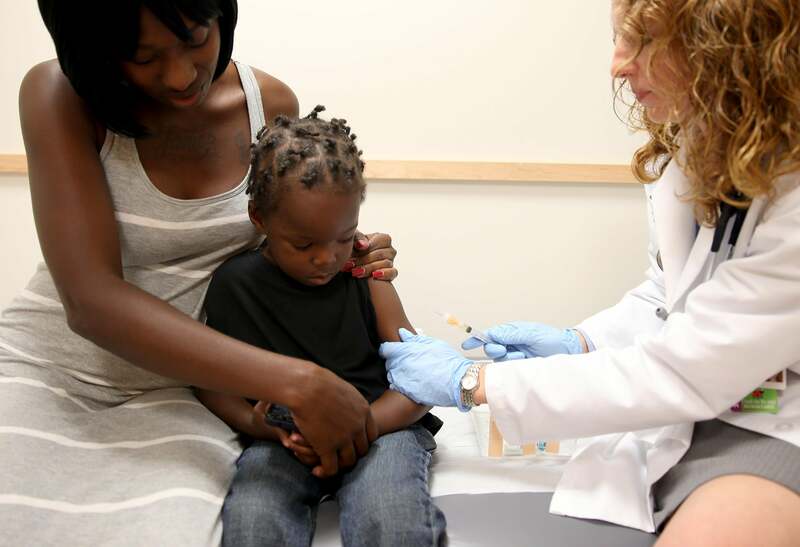 A woman holds her son as a pediatrician administers a measles vaccination on May 16, 2014, in Miami. Americans always seem to forget that in our insurance-dependent health care system, the collective pays for the individual. Since the group suffers the cost when any given individual falls ill, it benefits everyone to do all that is possible to prevent anyone from requiring medical attention, and vaccines are just one small way to do this. Let’s go through an example with some rough, back-of-envelope cost estimates. Jane decides not to vaccinate her child, Jimmie. Jimmie becomes afflicted with measles after a trip to an amusement park, requiring a visit to his pediatrician. Total cost thus far: $100. Jane stays at home from work to help take care of Jimmie (considering the economic implications of lost parental productivity is left as an exercise to the reader). Jimmie does not have an uneventful recovery and unfortunately begins to have seizures, prompting a 911 call and ambulance transport to the emergency room. Total cost thus far: $1,100. In the ER, Jimmie is seen by an emergency physician who orders a full battery of diagnostic blood tests and performs a lumbar puncture. Jimmie is subsequently diagnosed with measles encephalitis. Total cost thus far: $7,000. Jimmie continues to have multiple seizures in the ER and ultimately becomes unresponsive. He is critically ill, and the physician determines that emergent intubation is needed to ensure that Jimmie’s airway is protected so that he can adequately oxygenate his blood and maintain good oxygen supply to his brain. Jimmie is subsequently admitted to the pediatric intensive care unit for further evaluation and monitoring. Total cost thus far: $10,000. Jimmie stays in the PICU for one week before he is successfully weaned from his breathing tube. He is subsequently moved from the ICU and monitored for three more days as he undergoes recovery therapy. Total cost thus far: $60,000. You can see how quickly the costs can build up for a single case of a well-known complication of measles. If you apply this on a countrywide scale, as few as 100 similar cases brings the cost into the millions—virtually all of which could have been avoided. So what could happen if large numbers of people choose not to vaccinate, thereby allowing a resurgence of preventable illnesses? Insurance companies have to make profits to stay in business, so eventually these additional medical costs will likely be passed down to consumers in the form of increased premiums. Local city, state, and federal taxes may also bump to help fund hospitals who care primarily for the uninsured and economically disadvantaged. Large numbers of people who actively choose not to vaccinate cause the collective whole to bear unnecessary economic damages. That is, of course, just one reason that the vaccinated care about anti-vaxxers. It’s not our primary reason, but from a purely utilitarian standpoint, it’s a valid reason as any. From a resources perspective, you could extend this example significantly. There are only so many PICU beds in a given city, so each one represents a very scarce resource. If a hospital is forced to spend all of those resources on patients with preventable illnesses, then it cannot help other patients who come in the door. A PICU full of unvaccinated children means there is no room for the victim of child abuse, the child struck by a drunk driver, the infant born 10 weeks early, etc. Think about it. Immunizations: Why are some people against getting the seasonal flu shot? Measles: How many children have died in 2014 and 2015 due to their parents’ refusal to vaccinate them against measles? Medicine and Healthcare: What biological changes occur to our body after we are dead?